Update: New ALS drug? Has Stephen Hawking been using this drug the whole time? Coincidence or deliberate that Hawking is now in a new cosmo nonsense series? In one of the most blatant cases of (simulated) disabled abuse, we have another silly story. Leave it to renowned physicist Stephen Hawking to be the bearer of incredibly interesting yet wildly depressing news about the state of the world. In his forthcoming documentary for BBC, Expedition New Earth, Hawking predicts that planet Earth will only survive for the next 100 years. I hope no one is paying attention to this simulated psientist. If people really thought about it (and they don’t) they might ask has does someone with ALS survive so long? What is the secret? Who wrote the software to convert cheek twitches into complex written theories? That guy is the real genius. Sometimes I think we will make it off this planet before everyone realises that we can’t. 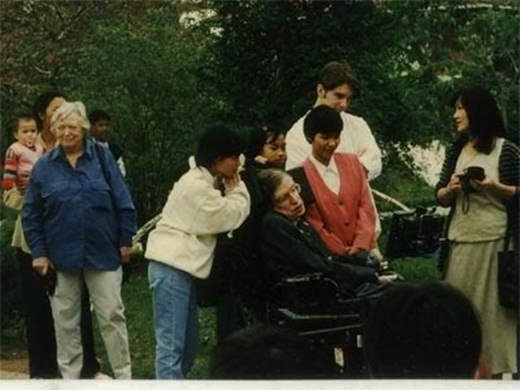 Hawking has a rare early-onset, slow-progressing form of amyotrophic lateral sclerosis (ALS) that has gradually paralysed him over the decades. He now communicates using a single cheek muscle attached to a speech-generating device. Over 50 percent of people with ALS live more than three years. Twenty percent live five years or more. Ten percent live 10 or more years. This entry was posted in Science hoaxes on May 10, 2017 by ab. Surprisingly, Lucy and her father have never talked about the motor neurone disease that has ravaged his body since he was diagnosed at the age of 21 (he was given two years to live but is now 62). It has always existed in her life – she has never seen him walk – but never discussed. Here he is protesting the Vietnam war. Yes, Vietnam war demo “Hawking” looks too short sighted even for Mark I Hawking. Hawking Mk II did go to Vietnam though with Mrs H Mark II. Apparently, he was a scream, performing wheelchair tricks for the kids – that’s his wicked sense of humour coming out yet again. She won’t elaborate on the years of her father’s second marriage, in which she didn’t see so much of him, but working on the book has, they both agree, brought them much closer. Sounds quite a sudden “death” – no mention of an ill health for some time. The excellent Cluesforum trhead is worth revisiting, which Ab mentioned a few years ago. What fascinates me is not just the late growth spurt of his lower incisors and his extraordinary survival with ALS but also his apparent cure for short sightedness – his spectacle prescription lurched away from myopia in later years. which neatly fits into the current “abuse” topic. Perhaps that too was a fake story. The UK media seems quiet on the “adoption” of the Vietnamese girl by the Hawkings [wife#2] but news sources in Vietnam have some super family images. He seemed to be having a whale of a time in the ‘vomit comet’ allegedly in 2007. The news breaks at 3.43 AM GMT [Daily Mail] 3.51 [Guardian] It’s clearly a “death” for the media. Quick, release a statement to the media. Can’t we grab some sleep, it’s half past three in the morning? No, gotta get it out for the 6 am news. Hawking’s children, Lucy, Robert and Tim, said in a statement: “We are deeply saddened that our beloved father passed away today. I very often wonder, could that character known as S. Hawking be a simple actor and by that I mean a totally healthy individual driving to the grocery store three times a week? My mother-in-law has been diagnosed with the same illness for 30 odd years. I’m embarrassed by this nasty attack on a champion thinker and visionary like Stephen Hawkin.? LOL! Donaghy can’t even get Hawking’s name right….